Hops tea is a calming tea ideal to drink after a stressful day that has left you feeling nervous and on edge. An herb best known for its bitter principles that are used as a flavoring agent in the beverage industry. With a long history as a nutritious herb, this plant is ideal to make a cup of tea that not only calms mind and body, but cleanses and heals it in many different ways. Take your time to learn about this tea and how you can best enjoy it. Come and have a cup of calming tea! Hops, humulus lupulus in Latin, is best known for being used to give flavor to beer. This herb is native to Europe and today it is produced in temperate climates in many countries around the world. This is a perennial climbing herb that grows in fields called hopfield or hop yards or gardens. It is a quick growing and spreading twining vine that reaches great lengths. Its leaves are dark green and shaped like a heart with finely toothed edges. The best and most useful part of the hops plant is the cone-shaped flower. These small flowers contain the nutrients and bitter oils greatly appreciated both in traditional medicine and for commercial purposes. Hops bloom in late summer and by early autumn the flower cones ripen and are picked. As soon as harvesting is done, the flowers are immediatly sent for drying to preserve their medicinal components and flavoring properties. Often referred to as the "good night flowers", hops has a long history in the beer brewing industry, dating back to the 14th century in the Netherlands. However, it is believed that hops has been cultivated since the 8th century. Ancient Greeks and Romans would drink hops tea as a treatment for all manor of digestive ailments. Romans also used hops as a garden plant, eating the young shoots in the spring. Today, hops is still commercially cultivated to be used as flavoring and stabilizing ingredient in beer production. It is still much valued as an herbal remedy, but many will just look to it as an ornamental garden plant. Much like the Romans, some people still enjoy eating hops as vegetables because the nutritiously rich shoots are edible and may be eaten in the place of asparagus. 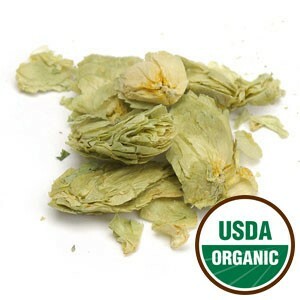 Hops is a plant rich in nutrients, making each cup you drink a healthy and nutritious beverage. It contains vitamins A, B-complex, and B3; minerals such as calcium, copper, fluoride, iodine, iron, magnesium, manganese, phosphorus, potassium, selenium, silicon, sodium and zinc. Hops also contains volatile oils, valerianic acid, tannins, flavonoids, estrogenic substances, resin, lupulone and humulene. All these components are blended in yoru cup of tea to bring you the following benefits. Hops tea is best known for its positive effects of the nerves. A cup of this tea is said to calm nerves and reduce anxiety feelings. It is said to strengthen and tone the nervous system, helping to bring relief from nervous non-psychiatric disorders, such as hysteria. It has also been used to promote restful sleep, calming the mind and thus fighting insomnia. Hops herbal tea should be helpful for those who tend to wake several times during the night and are light sleepers. Tip: take a cup of this tea at night and then prepare a comfortable bed in a room that is neither too hot nor too cold and then avoid watching TV or any device and just let yourself relax. Some people even put pouches with hops under their pillow to induce sleep. Give it a try! This calming tea may also help to soothe pain, reducing muscle spasms and painful cramps. Its sedative properties help to treat headaches and migraines relieving tension in the brain and nervous system. It is said to help reduce sexual excitation, calming and balancing excessive sexual drive and reducing libido. Hops herbal tea may also help to inhibit cravings, helping smokers to remain calm while quitting their habit. Taking hops tea may help imporive your digestion. Its bitter properties help stimulate stomach juices and boost your metabolic rate. This could help you when you suffer from indigestion or heartburn. Its calming features also soothe digestive problems due to nerves and stress. Hops tea may even help improve your appetite, relieving burping, soothing peptic ulcers and helping your stomach to remain calm as you enjoy your meals. This herbal tea may also treat intestinal issues such as constipation, Crohn's disease and irritable bowl syndrome, calming spasmodic action in the colon. It may get rid of the harmful elements and parasites that could be causing flatulence or even diarrhea. Hops tea may prove to be a great tea when you are suffering from a bladder infection. It is said to help relieve the pain caused by this infection. It may help fight the infection in the sense that it is said to help eliminate toxins in the body and get rid of harmful bacteria. You may take this tea as a detoxifying agent, helping the body to eliminate wasteful elements, clearing away causes of inflammation. It is said to cleanse the blood, lowering levels of sugar in the blood, and it may also act as a diuretic reducing fluid retention. Its bacterial action may also be useful when you need to soothe a sore throat or treat other chest problems. Its antioxidant properties may help boost your immune system, preventing these diseases from occurring as well as possibly fighting the onset of tumors. Hops tea is ideal for women who are going through menopause. This female tonic may help calm nerves and mind, while at the same time relieving symptoms of menopause such as hot flashes and insomnia. This herbal infusion contains the natural estrogens you may need at this time. Tip: blend this herb with black cohosh for fighting these symptoms. For nursing mothers, this tea is said to help boost the supply of breast milk. However, it is not advisable to take this tea while breastfeeding unless recommended by your doctor. Monitor your baby's reactions carefully. The presence of estrogens in this herbal infusion may also prove to be helpful for when who suffer from constant menstrual problems. If your checkup has not revealed any serious problems, then ask your doctor about drinking this tea to help soothe PMS and bring balance to your hormones. Applied topically, hops tea may be good for your skin, keeping it healthy and clean. It may be used for its antiseptic action to clear and heal sores, wounds and other skin injuries. Soak a towel in warm hops tea and apply to the inflammed area for a calming and healing action that could even help relieve pain associated with arthritis. After a long day, soak your feet in a foot bath infused with hops to clear away any possible harmful agents while helping to rest our tired feet and improving the skin. Try a cup of hops herbal tea now! When drinking hops tea there are a few things you should be aware of. As this is a calming tea, taking hops during the day may cause some drowsiness, particularly for those who are very tired and unaccustomed to calming teas. If you are sensitive to polen, you may experience skin sensitivity in the form of an allergic rash when handling the dried hops flowers. When applying topically make sure to apply on a small area of skin to test for any possible reactions. Hops tea may enhance the effects of some medications, particularly birth control pills and hormone replacement therapy. If you are taking any prescription medication you should always check first with your doctor before drinking any tea medicinally. Prolonged use is not adviseable. While stimulating the stomach may help at first, overstimulating the stomach may have the reverse effect and begin to cause stomach pain. In the same sense, the estrogenic effects of hops tea may, with prolonged consumption, cause irregular menstrual periods in some women. If you suffer from depression then speak to your doctor about drinking this tea so that s/he may recommend the proper dosage for your particular situation and medication. Large amounts of this tea are best avoided in this situation. If you are pregnant then it is best to avoid hops tea altogether, as it causes uterine contractions that stimulate menstruation. Breastfeeding women should avoid this herbal tea as it is not recommended for children under the age of 2. In fact children over 2 and adults over the age of 65 should stick to weaker forms of this tea. If you suffer from excessive acidity in the stomach, then it is best not to drink this tea as it may be used to stimulate digestive fluids and make you feel worse. People taking medication to control sugar levels in the blood should not drink this tea, as it may enhance the effects of the medication and your sugar levels could drop to dangerous levels. This herbal tea is best not taken by men, as its sedative effect and impact on estrogenic production may prove to cause a drop in male libido. Unless you are searching for a solution to relieve sexual excitability, then you should not drink this tea. To make the most of the benefits of hops tea, you should learn how to make hops tea. Making this tea is easy, you can do it using fresh or dried hops flowers. Fresh flower hops tea is considered best for digestive problems, whereas dried flower hops tea is more indicated for insomnia or other sedative action. While some recipes suggest immersing hops flowers in hot water for about 4 hours, here is a recipe that should help you to get a cup of tea more quickly, even if it is not as strong as would result from a longer infusion. Start by bringing water to a boil. Use an electric tea kettle for a quicker and safer way to boil water. Place 1 to 2 teaspoons of hops flowers per cup of water in a teapot. Pour the hot water over the herb and let the hops soak for 10 to 15 minutes. Strain and drink at the most 3 cups per day. You may drink this tea either hot or cold. 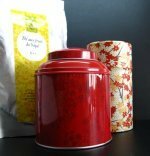 The leftover tea may be refrigerated for up to 2 days. This beverage may taste bitter so add honey to it or blend with other calming herbs to improve its flavor such as: chamomile or passion flower. Another soothing herb that may be blended with hops is valerian, but be aware that valerian itself has a rather strong smell. Drink a cup of this tea at night to help you sleep better. Also consider taking a soak in a hot bath infused with hops to relax both the mind and muscles. When drinking this tea as a digestive aid consider blending it with peppermint, lemongrass or with ginger. Buy Your Hops Tea Today! Click on the image or on the link below to purchase from Starwest Botanicals your hops flowers. Use this organic herb to quickly make a cup of calming tea. While this may be a bitter tasting tea, it is a soothing and relaxing infusion that will help you get restful sleep. Buy your hops flowers here! 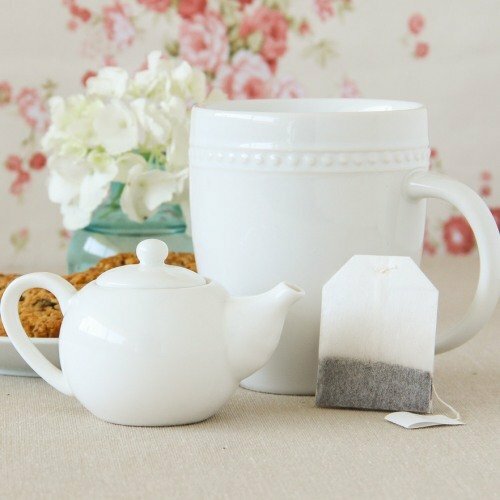 End your stressful day with this relaxing tea and live a calmer and happier life. 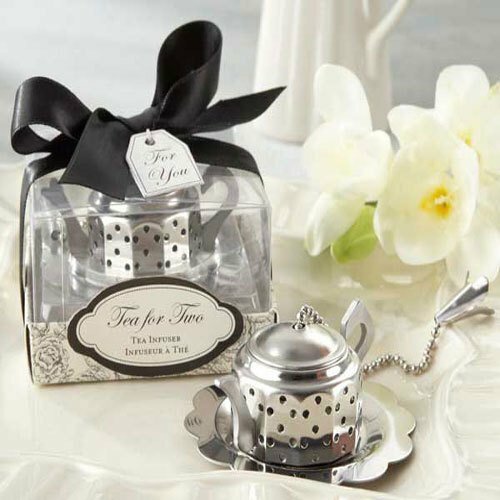 Enjoy a calming cup of tea.